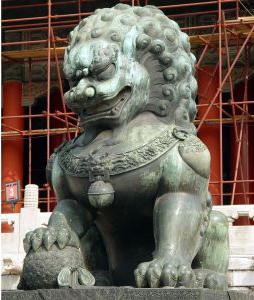 In Chinese mythology, dragons can bring prosperity or destruction to villages and empires. China currently faces two dragons: the trade surplus that brings prosperity to Chinese manufacturers and urban workers, and inflation, which threatens China's price stability. Bloomberg reports that China's trade surplus might be fueling China's inflation problems. One possible explanation is that the increase in the trade surplus outpaces the increase in potential output. Net exports are one component of aggregate demand in China. An increase in net exports pushes the aggregate demand curve to the right. Potential output increases as China utilizes more of its work-force (labor-intensive growth) and increases its capital stock (capital-intensive growth). 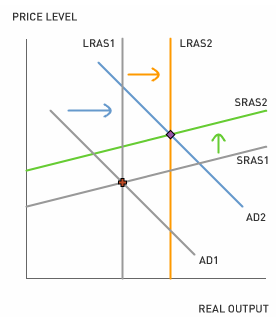 The graph below shows that the increase in potential output (LRAS1 to LRAS2) is less than the increase in aggregate demand (AD1 to AD2). Whenever the increase in aggregate demand exceeds the increase in potential output, inflation is sure to follow (for example, from SRAS1 to SRAS2). 1. China maintains a relatively fixed nominal exchange rate between the yuan and the U.S. dollar (nominal exchange rate = 8 yuan per U.S. dollar). The real exchange rate is the nominal exchange rate times the ratio between the U.S. price level and the Chinese price level. The real exchange rate also represents the cost of U.S. goods and services relative to Chinese goods and services. How does an increase in China's inflation rate affect the real exchange rate? 2. How does an increase in China's inflation rate affect the trade balance between the United States and China? 3. The People's Bank of China often keeps its nominal interest rate equal to the United States' nominal interest rate in order to maintain the fixed nominal exchange rate (interest rate parity). Can the Bank of China choose to fight inflation and keep the nominal exchange rate fixed? A minor correction. The central bank of china is people's bank of china, not bank of china, which is a state-owned commercial bank... don't want this tiny error ruin the great blog..
China's economics are too complex to be analyzed through some simple graphs based on static economic analysis. The fact of the matter is that despite super-fast growth, there are no signs of inflation; rather sign of deflation being readily found. Anyone interested may browse my weblog http://chinastreeteconomist.squarespace.com - for fun and casual browsing. An alternative approach that explains China's increasing inflation rate is the quantity theory of money. Hence there are two sources of inflation--money growth and velocity growth. And there is one source of deflation--output growth. If the change in (m + v) exceeds the change in y, then the inflation rate will increase. taken from thomson financial on April 30 2008.
percent lower than the year before. prices will come down to $80 a barrel and thats what we all want it to be.